They say a picture paints a thousand words, so we’ll keep this short. While not normally one for the new fad of statistical over-kill in the modern game, this heat map of Christian Benteke‘s league goal scoring record from last season does make interesting viewing. 1. 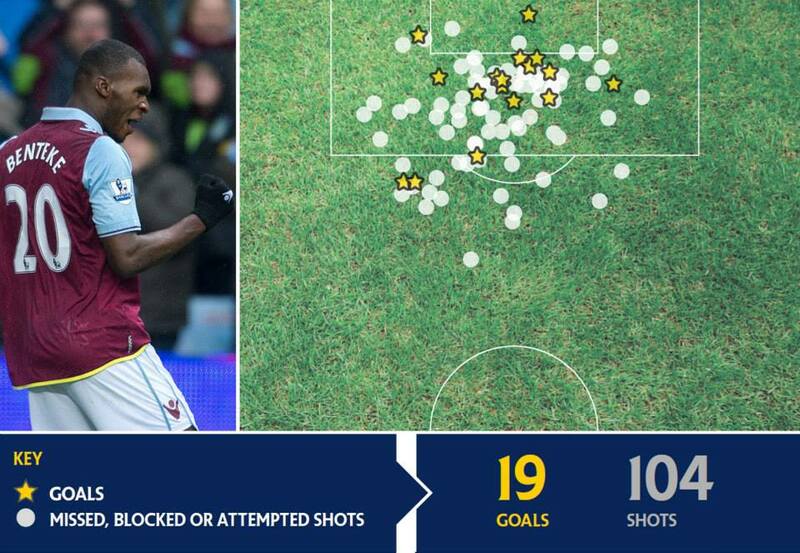 Benteke can basically score from anywhere and has a decent approx ratio of one goal for every five shots. 3. Benteke only scored one league goal inside the six-yard box, suggesting he’s certainly not your Gary Lineker poacher type of striker. 4. Pretty even spread of right and left side shooting. 5. Needs to add a Petrov-from-the-half-way-line attempt to his arsenal of shots! Although, there is one decent 35-odd-yard attempt on the picture.